The X-Men Marvel Comic slot is a 5-reel 9pay line slot with bonus feature. The maximum jackpot is 7,500 coins and the game has some of the nicest graphics and sounds you’ll find from any video slot. At Pubfruitmachines.co.uk we review all the best slots as well as fruit machines, and the Marvel slots are definitely some of the most entertaining you’ll find at any online casino. This is down to Cryptologic’s superior development of all its projects, making a truly authentic super hero themed game. The slot features no less than 10 famous characters from X-Men, each with an intriguing amount of detail both in the symbols and the animations. The X-Men slot features a number of Marvel characters including Wolverine, Sabretooth, Storm, and Cyclops, each of which is animated with great graphics to make this a thoroughly entertaining video slot. The best thing about the X-Men slot is the bonus round game which is activated by matching three or more “X” symbols on any reels. In the bonus game, you are rewarded for the number of districts in the city you defeat the enemy in. You must select a different member of the X-men team for each district to do battle, so choose the winner and you are looking at a whopping payout. The bonus round Cryptologic have crafted is definitely one to take note of, displaying a great mix of razor sharp animations and imagery to create an exciting battle scene. 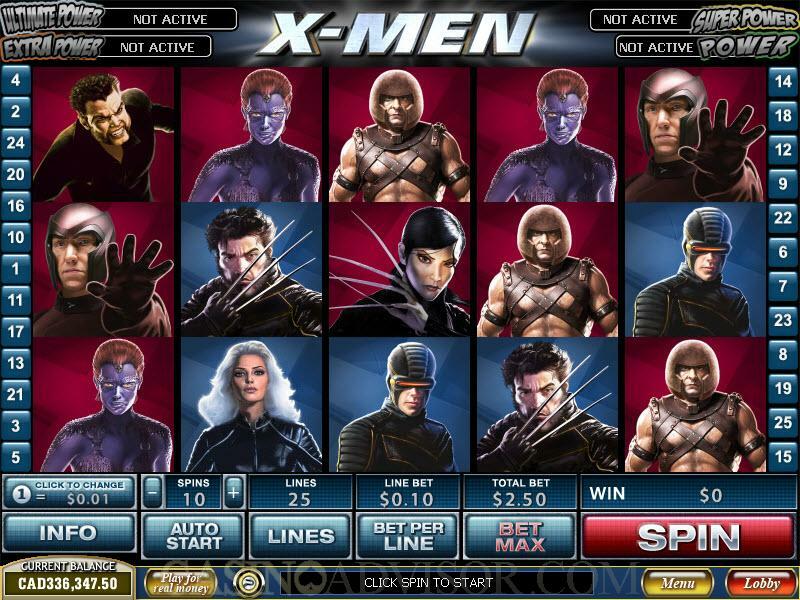 To complete this awesome Marvel based Slot, X-Men features a four level progressive jackpot. The amazing component of this jackpot is that it is triggered randomly during game play: regardless of stake or even if a winning line is hit. Players are greeted with a 4×5 grid, in which they must match one of three progressive jackpot logos to reap the respective reward. This is a truly exciting round, as the chance to scoop the Ultimate Power Jackpot is always possible! Intercasino Featuring X-Men and all the Marvel Slots, Intercasino comes highly reccomended. Littlewoods Littlewoods online casino is the home to all the Marvel slots including X-Men.